“You have been providing payday loans to people who are mentally retarded and mentally ill. You have provided payday loans to people who are illiterate, who cannot read the very contract you have them agree to. This is wrong”. These were the words of a staff member of St. Vincent DePaul Society in Southeast Missouri. 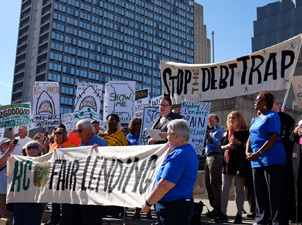 She was part of the 50-60 people who gave personal testimony at the Consumer Financial Protection Bureau (CFPB) Hearing in Kansas City, Missouri on June 2nd. This public rally and hearing has long been in the works. 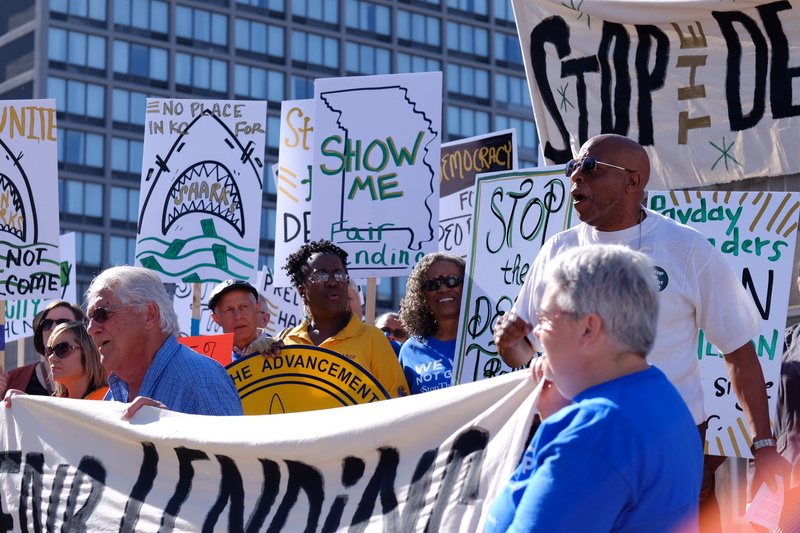 In 2012, activists throughout Missouri gathered signatures to put payday lending reform on the statewide ballot. Signatures were easy to come by as citizens throughout the state saw these payday lending storefronts everywhere but mostly in low income communities. Missouri legislators failed to pass laws to reduce the ceiling on interest rates for payday loans below 450%. Industry leaders and the Missouri Equal Credit Opportunity have amply contributed to state legislators, the Black Caucus, and the Urban Summit to the tune of over $2 million in the past 3 years. Over 1,000 people joined the public rally. 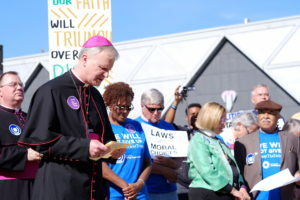 The highlight for me was seeing Bishop James V. Johnston Jr., the new bishop of the Catholic Diocese of Kansas City-St. Joseph, alongside of the Rt Rev Martin “Bishop Marty” Field of West Missouri leading a long procession of faith leaders and social justice activists. The rally participants came from all over Missouri, parts of Kansas, Nebraska, Iowa, Texas, Florida, and Pennsylvania. Kansas City was selected for the hearing because some of the most egregious abuses have occurred here. As anticipated, two large charter buses pulled up in front of the Music Hall to deliver over a hundred payday loan workers from surrounding areas. The employees of these storefront payday loans made the pleas to oppose the proposed regulations. During the four hours of hearings many of them stated how their services helped people in desperate situations. Activists and faith based speakers prefaced their comments with their name with “and I am not paid to be here.” One woman working at a payday loan office made an emotional plea not to enforce the proposed regulations since she needed her job; she just purchased a home and has two daughters to support. How perverse is this? The stories were painful to listen to as they told of loss of income to pay the rent, purchase medications, pay for transportation, feed their family and maintain their housing. Some told of their loss of their homes, the marriages, their cars were repossessed, and several committed suicide. Rev. Dr. Cassandra Gould, of Missouri Faith Voices, spoke eloquently about the need for strong regulation to put an end to the predatory nature of these loans. Predatory lending, she said is “a scourge on minority communities.” She advocated support for the federal consumer agency’s new proposed regulations, especially the call for a measure of underwriting before a loan is issued. “Basically, to get a payday loan, all you need is a checking account and to be breathing,” she said. This was a woman who had worked in banking for 17 years before going to divinity school. I testified on behalf of a graduate student of mine at the University of Missouri-Kansas City. She struggled with her classes, not because she was not capable but because she had student loans and a payday loan to the amount of $80,000. She had no transportation and a fragile housing arrangement; she was the guardian for her grandfather and worked at a coffee cafe to get by. She couldn’t be at the hearing because she finally got a job. With her marginal income it will take many years in the prime of her life to pay off her spiraling debt. The Consumer Financial Protection Board posted their proposed new rules online just before the hearing. Proposed regulations are “Aimed at cleaning up unfair, deceptive or abusive practices that harm consumers” said Richard Cordray, Director of the CFPB. Many have said that what is most needed is a cap on the ceiling for interest rates. The CFPB does not have the authority to do this, but many suggest the cap that is put on military payday loans which have a ceiling of 36%. The 90 day comment period opened at the hearing and once the proposed regulations are finalized they will go into effect most likely next year. These rules do not require Congressional approval. You can comment on the proposed rules online at https://www.regulations.gov/ or by phone at 855-729-2372. This entry was posted in Front Page, Income on June 8, 2016 by networklobby.